Some of you may remember the Medieval Mars anthology that came out in 2015. This shared-world project is the brainchild of Travis Perry at Bear Publications. The premise is that a thousand years in the future, after humans terraformed and colonized Mars, a societal collapse has thrown the planet back into a dark age in which they have mostly lost the ancient technologies of the original settlers. In that book I had a short novella about the crew of the airship Phoenix. I so fell in love with my characters that I wanted to continue their story. So I wrote two more novellas. The Terraformed Interplanetary series has since moved on to Venus and Mercury, so another Mars book was not in the offing. But I sent my stories to Travis, and he agreed to publish all three novellas in a single book. Since the Phoenix is described in detail and is, dare I say it, unique, stock photography really would not do for the cover. So I recruited illustrator Tori Sharp, who once did a brilliant cover illustration for Havok magazine. She not only took my descriptions, she read the whole book — that’s dedication! And she produced a brilliant wrap-around cover. Astrid Laakkonen wants to fly. As a child, she used to soar through the sky on the backs of Mars’s giant birds. But fully grown, she’s passed over for young, lightweight jockeys. It seems she’ll be grounded forever, until Ian Kahoon shows up in a gleaming airship. His arrival sparks new dreams for Astrid—dreams of love and a life in the sky. Astrid and Ian battle through a fierce storm and a fiercer society to stay together. But when the king commandeers the airship Phoenix for a battle with pirates, it may cost them everything they hold dear. On a future terraformed Mars, a collapse of civilization has led to a new Dark Ages, and the ancient days of technology are seen as an Age of Magic. But the builders and crew of the Phoenix are determined to recover the science of ancient days—the days when people flew between worlds. 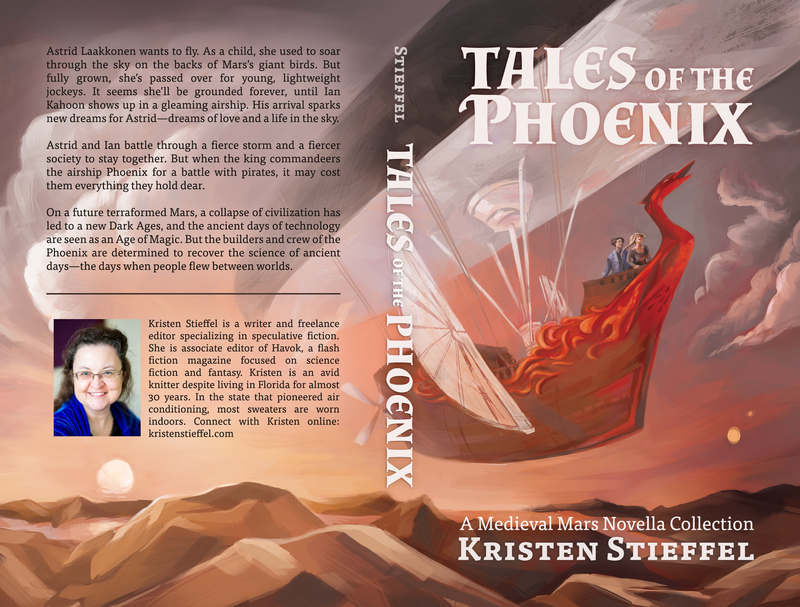 Here’s the link to the Kindle version of Tales of the Phoenix. Print edition coming soon!